Employees, you are not bondservants. Some would say the two are to be compared. And so we compare. Bondservants, otherwise known as “slaves,” have nearly no rights or freedoms. They may be given room and board, but otherwise are rarely paid. They generally have no say concerning any matter and are strictly bound to their masters. Employees live freely and enjoy rights and privileges. They are always paid and are welcome to give their two-week notice at any time. 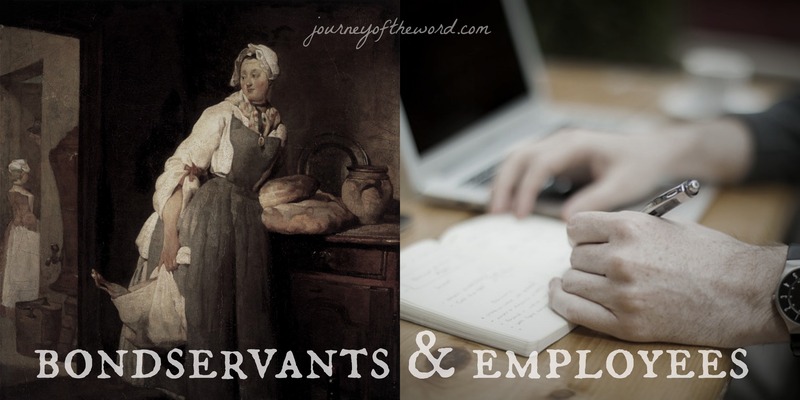 The Bible speaks of both bondservants and hired workers. We can identify with hired workers perhaps, but not directly with bondservants, because this status or field is practically non-existent in our day. Take note. The following instruction is for bondservants, not employees. Concerning all Scripture, we must seek to discern what is being said, to whom the author is speaking, and what it is that we may properly learn and apply. The bondservant-master relationship of the Scriptures is not that which comes to our minds when we think of slavery. A bondservant of this nature might actually seek such a position for its provision and livelihood, often offering themselves to a master. Though kept in a truly binding position by many standards, this bondservant was most often treated well. This is a kind of righteous slavery, as we see Paul confirming it again and again. He doesn’t instruct the bondservant to escape, to fight, or even to endure the “trial.” He instead admonishes him to obey sincerely and to do good in a loving manner. Paul says this is the will of God. Slavery, in this context, is not condemned. Paul doesn’t command them to release their slaves. He rather impresses upon these masters the importance of treating their slaves properly and fairly. Scriptural instructions to bondservants and masters, though not “workplace instructions,” are important for us. They have been preserved for us for a reason. Yet when God speaks to wives, He’s speaking to wives. I have something to learn from it, though I am not yet a wife. When God speaks to Jonah, I have something to learn from it, though I am not Jonah. When God gives instructions to elders, I have something to learn. I will never be an elder, but the instructions to elders are important for me. Then what shall we do with the bondservant instructions? First, I shall remind myself that I am a bondservant. Once of sin. Now of a new Master. Thank you so much for always upholding the Truth of the Word in your blog posts. I have gained many new insights about the term bondservant and the Scriptures that word appears in and realized some of those verses, I may have misapplied. I always leave your blog feeling edified. I have heard this comparison made before, and I appreciate you digging in to it. I agree with your conclusions, and feel equipped to discuss it if the matter arises. Thanks!